Nice for the price. I would recommend these. This Salvador barstool set by iNSPIRE Q ® Classic makes a charming addition to your bar, instantly offering more seating for your family or guests. Each stool features beautiful solid rubberwood construction, a variety of antique wood finishes, and a curved saddleback seat. This 29-inch stool set stands at standard bar height, ideal for family and friends. I really love these bar stools. They’re actually quite comfortable and the color is perfect. We ordered the white and it looks very rustic. The only reason I’m giving this 4 stars is because the holes were drilled just a little off, the screws still went in but it was a little more time consuming that it should have been. We love our Salvador II saddle seat bar stools. We have used them at our kitchen counter (center of action in our house!) for about a month now and have received many positive comments from visiting friends and family. The workmanship is is excellent and they are very sturdy. The oak color is very close to the picture on the website and is an excellent match with our existing oak counter and cabinets. Another specification “must” for us was safety for our grandchildren, and I am happy to report that our little climbers have been on and off these stools several times a day and they stand strong... not tippy or rickety at all. The only problem we had is that in order for us to exchange the first set we purchased for the correct color, we had to return them for a refund less shipping costs, then re-order the new set for a new price which was higher than the original sale price. We have always received excellent service at Overstock so finally just decided to let this issue pass with a “note to self” to be very sure about their return policies before ordering in the future. Easy to assemble. They look great and I love the antique white color! Perfect addition to my home! This is a terrible item. The screws provided burred right up and two screws were wouldn't properly seat. About 1/8 to 1/4 of an inch of the screw was outside of the wood. I will not use overstock again. Absolutely LOVE the color of these stools...perfect for when you want white, but not actual white. Nice antiqued white but not too shabby. I like the seat size too...not quite as wide as others, which is exactly what I wanted. Love, love, love these barstools! They look amazing! My husband also loved how easy they were to put together. The quality of these stools is really good and they match with the other INSPIRE collection (oak table) that we bought. Great stools for my small kitchen bar. They are sturdy and were simple to put together. Comfortable seat, just the right height and the color (slightly distressed black) is great. I love them, kids love them and they look fabulous. Shipping was really quick too:). I love the color of this product, they were very easy to put together and the perfect height for my family and I. They are very sturdy and seem as if they will last a while even with children using them!! Bar stools are perfect! Easy to construct and very sturdy. 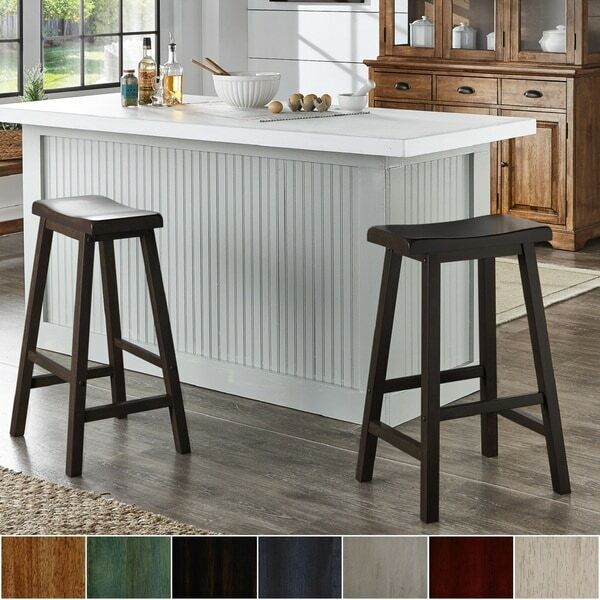 I purchased these bar stools for my kitchen island. I should have read the height before buying because they were too tall. You towered over the island. I also didn’t find them to be very sturdy. I love these barstools! Very sturdy and put them together in a breeze! Ordering 2 more! Thank Overstock! These are a nice washed green fits under my countertop and goes well with my white cabinetry. I got 2 pairs to fit the length of my bar. I put felt pads on the bottom and they don’t scratch my floors. They look great can’t wait to get them! They should look great in front of my island!